In our efforts to encourage more young Australians into international agricultural research, the lifelong work of John Schiller may provide encouragement. While more recently he has been carrying out training with the Crawford Fund, Dr John Schiller, Honorary Senior Fellow at the School of Agriculture and Food Sciences in University of Queensland spent a total of 18 years living and working in Thailand on AIDAB/AusAID projects. The first project was the Thai-Australia Land Development Project in Northern Thailand between 1972-1980; the second was with the Australian Contribution to the National Agricultural Research Project, a joint Australian-World Bank project in the Thai Department of Agriculture, between 1982 and 1990. We recently filmed John who explained his work and passion for Asia. In 1976, a young John was photographed with the King of Thailand, H.E. King Bhumibol Adulyadej visiting Nan province near the Thai-Chinese border on one of the King’s agricultural development projects. “I worked on this project from 1972, after completing my PhD studies, until 1980. 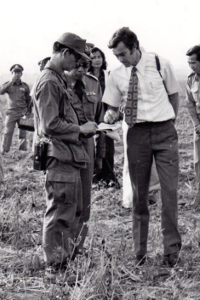 As the Thai agency with which the Australian project was associated, the Thai Department of Land Development was also linked to many of the king’s agricultural development projects, occasionally we would be invited to visit the king’s agricultural projects,” explained John. Then last year, the Australian Embassy included one of these photographs in its annual calendar. 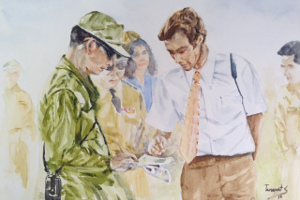 Recently, Mr Sueb Siribanasitt, a long time friend of John’s, did a painting based on the photograph of the meeting between the king and John. Such are the long-term friendships forged around agricultural research.